I began as Principal of Knox Centre for Ministry and Leadership 3 years ago today. This very day – newly back in New Zealand, new to Dunedin, new to the Presbyterian Church of Aoteroa New Zealand, I nervously approached the large, foreboding doors of the Hewitson Wing. My first day/lectionary text is recorded here, my first staff devotional here and my end of first week “three words” reflections here. An anniversary is a good a time as any for reflection, so I took a bit of time to write some poetry this morning, while this afternoon I pondered the KCML Strategic plan. The Strategic plan was approved by Council of Assembly in June 2016 and was effectively my first 9 months of work, across the 5 geographic Presbyteries and 3 Synod’s, engaging, listening, testing various parts. The KCML strategic plan involves 4 key directions. contextually agile ministers (Nationally ordained) – ensuring training prepares people for a diverse New Zealand, across cultures and generations. Three years in; and just over 2 years on from gaining the green light from Council of Assembly, there has been progress across all areas. Each post-it is an explanatory blog post in its own right, but there is a pleasing spread of colour and activity. There is also increasing overlap, as Lighthouse innovation incubator weaves into the New Mission Seedlings and the livinglibrary website becomes a locator for both national learning and lifelong learning. There is much that beckons into 2019. 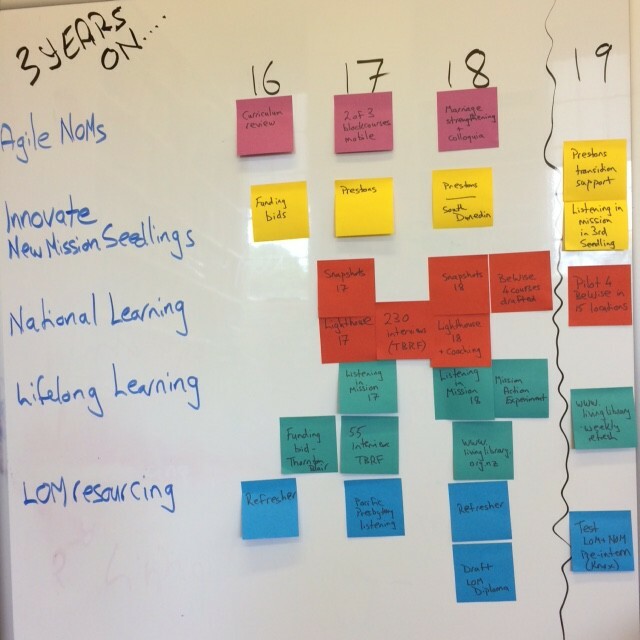 Alongside the visibility of post-it notes of progress, there has been lots of other activity as the KCML team have sought to be faithful to the call of the church. In some ways, this has been the most complex thing to navigate. The strategic plan has come on top of existing activity. Without additional people resources – in fact with diminished people resources – we’ve struggled to balance priorities from the past alongside the pressures of the present and the possibilities of the future.